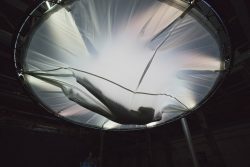 A Sense of Gravity goes in première at STRP Biennale 2019 on the 30st of March 2019. For almost two years, Teun Vonk has researched, experimented and prototyped to develop its final prototype. At STRP Biennale you will be able to experience A Sense of Gravity for the first time. Immerse yourself in the installation and feel the sensational bodily experience of defying gravity. Studio Tony Sparks thanks the Mondriaan Fonds, TodaysArt, STRP, CBK Rotterdam and V2 for their generous support.